The Printmaking Workshop has four different rooms, each with a different focus on a graphic technique: high pressure, etching (intaglio), lithography (planography) and screen printing. The High Pressure Workshop provides an assortment of rollers, ink plates, and test sheets as well as a height-adjustable press to print woodcuts and linocuts. All intaglio techniques, such as engraving, etching and aquatint, can be applied in the Etching Workshop. The Lithography Workshop has four stone printing presses; the two 19th-century cast iron printing presses are functioning museum showpieces. 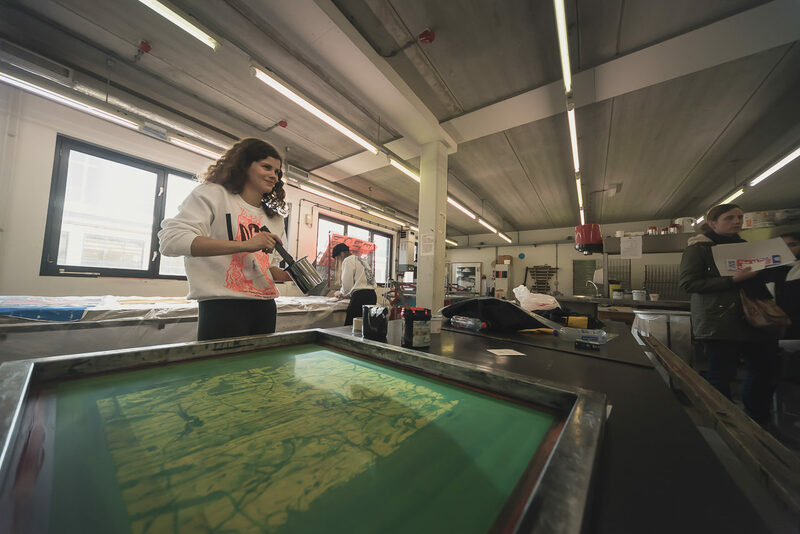 The spacious Screen Printing Workshop offers students all of the possibilities to produce screen prints, on paper but also on cloth. This workshop works exclusively with waterborne inks and takes the utmost care in ensuring environmentally friendly practices (purifying water and carefully separating waste, for example). Students need prior instruction regarding use of the workplace and the related techniques under supervision of the teacher. After finishing these lessons, students are allowed to work autonomously in the workshops.